Enjoy these helpful Candida recipes to aid you in a complete candida cleanse! This page is mostly for simple breakfast recipes, although you can make them whenever you like. 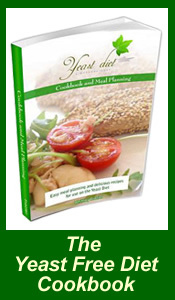 You can also look at more candida diet recipes for ideas for breads, soups, and more. Faithful adherence to an anti-candida diet will help you win the war against a candida infection. It is important that you also include include the right candida cure supplements to help you recover quicker and more thoroughly. Your immune system really needs this additional support. Over 100 delicious candida diet recipes for meals youcan eat during candida cleansing. Quick and easy download for immediate access. Order it Here! Hopefully these recipes will give you ideas for a bit of variety in your diet and still help you stick to the necessary restrictions. Cook oatmeal or oat bran in water or soy milk (sugar free). Top with a sprinkling of cinnamon or freshly-grated nutmeg. Combine all ingredients and cook overnight in a slow cooker (8-9 hours). Stir well and enjoy! Combine all ingredients and cook overnight in a slow cooker (8-9 hours). The millet tends to stick to the bottom, so stir well before serving. Mix ingredients with cold-pressed olive oil (optional). Spread on a baking sheet and bake at 180° for 45 minutes, stirring every 10-15 mins. Cool and store in an airtight container. Serve with natural yogurt, or soy milk. Yogurt is one of the easiest breakfasts of all, but you must be sure that your yogurt is hormone and antibiotic free. Try to eat free range eggs. You can make them either scrambled, boiled or poached, but not fried, unless in butter. When scrambling, you can try a little soya, or just scramble them in butter. If your case of candida is severe, you may not be able to tolerate tofu. Scrambled tofu is lovely. Just scramble the tofu like eggs. You can mix with onion and tomato for extra flavor. For a delicious, high protein breakfast, you can make up a simple stir fry with some of your favorite meats and vegetables. Cook in olive oil. Organic turkey or turkey sausage, cooked and placed in a warm corn tortilla makes a yummy breakfast, especially if you are having trouble with carbohydrates. I hope these candida recipes will be a big help to you in overcoming your candida symptoms and getting you well again.